Chickenpox causes spots (a rash) and can make a child feel generally unwell. Treatment aims to ease symptoms until the illness goes. Full recovery is usual in children. Serious complications are rare but are more likely to occur in children with a poor immune system, such as those on chemotherapy. 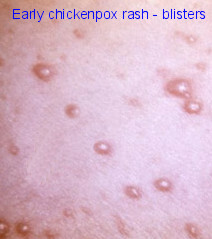 Chickenpox is an infection caused by the varicella-zoster virus. Most children have chickenpox at some stage. Most commonly, children get chickenpox before the age of 10. The immune system makes proteins called antibodies during the infection. These fight the virus and then provide lifelong protection against it (immunity). Therefore, it is uncommon to have more than one bout of chickenpox in your lifetime. High temperature (fever), aches and headache often start a day or so before a rash appears. Spots (rash). Spots appear in crops. They develop into small blisters and are itchy. They can be anywhere on the body. Several crops may develop over several days. Some children may be covered in spots; others have only a few or even none. The rash starts off looking like red spots, which then blister, and then scab over. Loss of appetite or feeding problems. 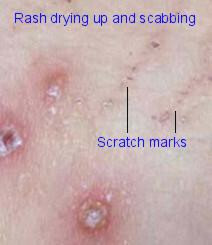 The spots do not usually scar unless they are badly scratched. Some spots become infected with germs (bacteria) in some cases. This is the most common complication in children. If this occurs, the surrounding skin becomes red and sore. Antibiotics in the form of creams or medicine may then be needed. Inflammation of the lung (pneumonia) and inflammation of the brain (encephalitis) are rare complications. Reye’s syndrome. (a very rare condition with brain and liver problems). Inflammation of the heart muscle (myocarditis). Inflammation of the testes (orchitis). Weakness such as a child becoming wobbly on his/her feet. Shingles is caused by the same virus that causes chickenpox and is a very delayed complication of chickenpox. Anyone who has had chickenpox in the past may develop shingles. Shingles is an infection of a nerve and the area of skin supplied by the nerve. It causes a rash and pain in a local band-like area along the affected nerve. About 1 in 5 people have shingles at some time in their lives. It can occur at any age, but it is most common in people over the age of 50. The reason why shingles may occur is because the virus does not completely go after you have chickenpox. Some virus particles remain inactive in the nerve roots next to your spinal cord. They do no harm there, and cause no symptoms. For reasons that are not clear, the virus may begin to multiply again (reactivate). This is often years later. The reactivated virus travels along the nerve to the skin to cause shingles. See separate leaflet calledShingles (Herpes Zoster) for details. Note: you can catch chickenpox from being exposed to a person with shingles if you have not had chickenpox yourself. However, you cannot catch shingles from a person with chickenpox, or catch shingles from a person with shingles. Advice on dealing with a high temperature (fever) is detailed below. A soothing cream (emollient) may help the itch. Calamine lotion is the one most used, although it is not known how effective it is. A sedating antihistamine (in a tablet or liquid medicine) may help with sleep if itch is a problem. This can be used in children over 1 year old. Give a dose at bedtime. You can buy these at pharmacies or get them on prescription. Chlorphenamine (Piriton®) is the one most used. Dress children comfortably so they are not cold or overheated. Use cool smooth fabrics such as cotton. You can give paracetamol to lower a temperature. You can buy paracetamol in liquid form, or melt-in-the-mouth tablets, for children. It comes in various brand names. The dose for each age is given with the medicine packet. Note: paracetamol does not treat the cause of the fever. It merely helps to ease discomfort. It also eases headaches, and aches and pains. You do not need to use paracetamol if your child is comfortable and not distressed by the fever, aches or pains. If your child is still distressed by a fever despite paracetamol, ibuprofen may also be used. A few years ago, there were some small studies which showed ibuprofen may increase the risk of developing skin infections. The National Institute for Health and Care Excellence (NICE) decided this was not convincing evidence, and that it is safe to use ibuprofen in chickenpox. However, it does make sense to use ibuprofen only when really needed and if paracetamol has not worked. Children known to react (have hypersensitivity) to ibuprofen. Children in whom attacks of asthma have been triggered by ibuprofen or similar medicines. Take extra layers of clothes off your child if the room is normal room temperature. It is wrong to wrap up a feverish child. The aim is to prevent overheating or shivering. Give lots to drink. This helps to prevent a lack of fluid in the body (dehydration). You might find that a child is more willing to have a good drink if they are not so irritable. So, if they are not keen to drink, it may help to give some paracetamol first. Then, try the child with drinks half an hour or so later when his/her temperature is likely to have come down. Do not cold-sponge a child who has a fever. This used to be popular, but it is now not advised. This is because the blood vessels under the skin become narrower (constrict) if the water is too cold. This reduces heat loss and can trap heat in deeper parts of the body. The child may then get worse. Many children also find cold-sponging uncomfortable. Some people use a fan to cool a child. Again, this may not be a good idea if the fanned air is too cold. However, a gentle flow of air in a room which is room temperature may be helpful. Perhaps just open the window or use a fan on the other side of the room to keep the air circulating. Children (babies) less than 1 month old. Children taking certain medication such as steroids, immune-suppressing medication or chemotherapy. Antiviral medication is also used for adults and teenagers who develop chickenpox, as they too have a higher risk of complications. However, antiviral medication is not normally advised for healthy children aged over 1 month and under 12 years who develop chickenpox. Nine in ten people who have not had chickenpox would catch it after being exposed in this way. Pregnant women who have not had chickenpox in the past. Chickenpox can be severe and cause complications during pregnancy. People with a poorly functioning immune system. For example, people with leukaemia, with HIV/AIDS, on steroid medication, or who are having chemotherapy. The at-risk children listed earlier. Healthy adults who have not had chickenpox may also want to avoid catching it, as the illness tends to be worse in adults. Note: people with chickenpox should not travel by air until all the spots have crusted over. If you have been immunised against chickenpox, or have definitely had chickenpox in the past, you are likely to be immune. You should continue working, but contact your occupational health department if you feel unwell or develop a rash. Avoid contact with high-risk patients for 8-21 days after the contact. Report to occupational health before patient contact if you feel unwell or develop a high temperature (fever) or rash. Get immunised against the chickenpox virus (the varicella-zoster virus). Yes, there is a vaccine that protects against the virus that causes chickenpox. It is part of the routine childhood immunisation programme in certain countries such as the USA, Canada and Australia. Currently, there are no plans to make immunisation against chickenpox routine for children in the UK. In the UK, the vaccine is offered by the NHS to certain groups. For example, healthcare workers who are not immune to chickenpox. Also, to people who are not immune to chickenpox and who are in close contact with people with a poor immune system. For example, brothers and sisters of children on chemotherapy. Should I let my child catch chickenpox? Some parents encourage their children to mix with others who have chickenpox in order to catch it. Chickenpox is usually a milder illness in a child than in an adult. The risk of serious complications is higher in adults. In particular, chickenpox during pregnancy can cause serious complications to both mother and baby. Most people get chickenpox at some stage. As the risks are fewer if you have it as a child, it may be better to get it over with. Although rare, some children do have serious complications. Different parents have different views on this issue. And remember, children who develop chickenpox spots (the rash) today will have been just as infectious over the previous two days when they were well, but were incubating the virus. Also note: if someone in the family or home is temporarily at high risk of complications (listed earlier – pregnant women, etc) then it is best to put off deliberately catching it.